This modern-chique cafe bistro is named after Amelia Earhart, the first woman who flew solo across the Atlantic Ocean and her photos can be seen inside the cafe. They have a great terras which is always packed with bohemian Tel Avivians sipping on their cafe latte and eating a salad. Emilia has the basic cafe food, like salads (Caesar, chicken, Israeli and roquefort); sandwiches (tuna, egg, chicken, salmon and etc.) served with a salad. Most people order the pasta special of the day, which is quite good. If you feel like eating something more substantial, order one of the main dishes. The grilled chicken breast with herbs is recommended - you get a good portion of succulent chicken breast with crispy fries. Between 12:00pm-5.00pm there's a business menu offer. You pay only for the main course and you get a salad or soup and a drink aside. 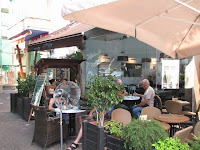 Emilia is on Dizengoff a bit norther to the Dizengoff center. It's on the corner before the Dizengoff Square. * Detail: every Friday there's a live band inside the cafe playing jazz music from 5:00pm-7:00pm.